I have a fairly well documented love of NARS which is ongoing, but if you've seen any of my Instagram shots, there is another brand that always pops up in practically every single one of my daily makeup pictures, and that is Chanel. 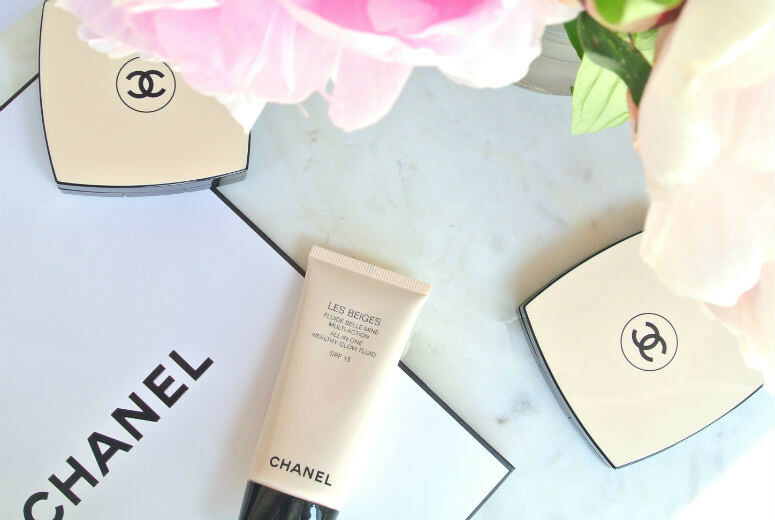 I am a great fan of Chanel foundations because of just how natural they look on. I also always carry the Les Beiges Healthy Glow Powder in my bag wherever I go. Considering how lately I've been wanting a lighter base, something much more natural. 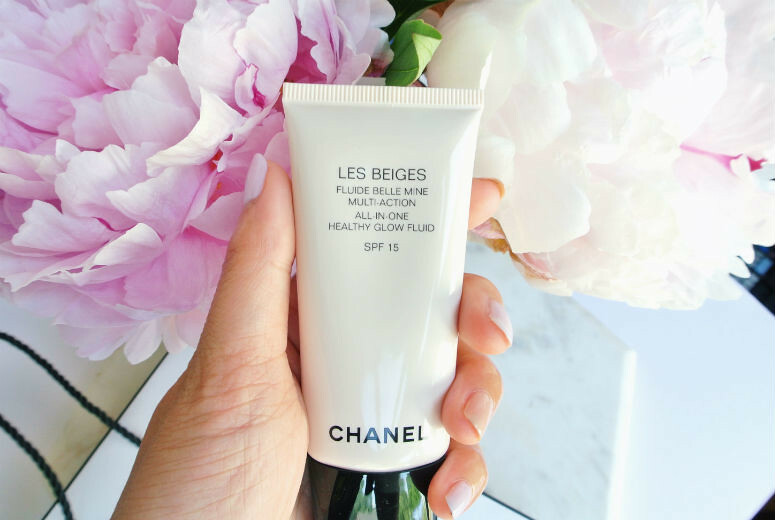 I found myself back inside the Chanel store, and walked away with the Les Beiges All-In-One Healthy Glow Fluid in my hands. 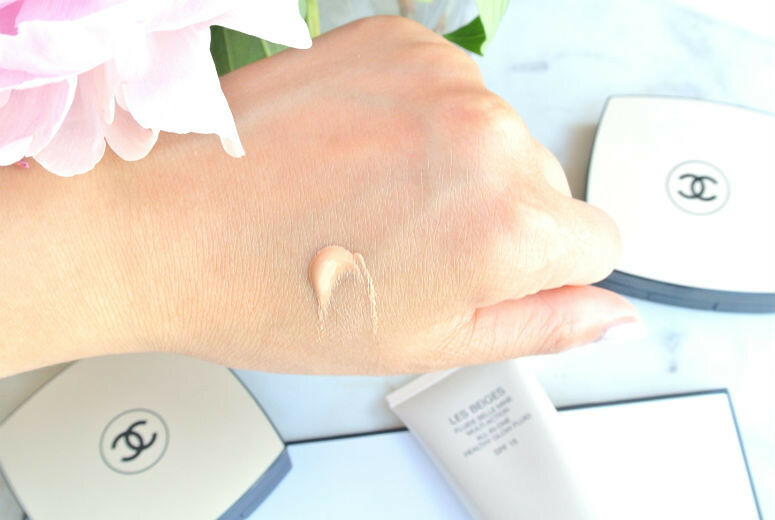 The Healthy Glow Fluid is a lovely lightweight tinted moisturiser. When I say lightweight, I really do mean lightweight. I can barely feel it on. It definitely is more fluid in texture than say the NARS Tinted Moisturizer for example, and much much lighter than the Laura Mercier oil free version I have. In terms of coverage, I wouldn't say that this is the best, far from it. If you have very dark acne scars, you may find that this is just better under a thin layer of foundation. If you don't have any dark spots to worry about or they are fairly light/you're pretty confident, then a layer of the Glow Fluid and some concealer will carry you through the day. If you are on the oily side, you may find the need to apply a little bit of powder across your t-zone. What the Healthy Glow Fluid will give you is exactly in its name: a lovely healthy glow. You know that gentle sheen you get on your face when you've been on the beach for a couple of hours, and your skin has just gotten a tiny hint of a tan? This definitely emulates that look. You will definitely feel that your skin looks amazing. If you have any redness, smooth this over your face, and you wouldn't even know. As with all Chanel face products and skincare, this is quite perfumed with their signature skincare scent (which I think is based around Camellia Flowers), so if you're sensitive to perfumed products this might put you off. I personally do't have an issue with them, and rather like the smell. For summer months also, I would recommend putting on a separate sunblock before applying this, as the SPF in this is only factor 15. Price-wise though, it is £34 for 30ml. The NARS Tinted Moisturizer is £29 for 50ml with SPF30, and the Laura Mercier ones are £34 for 40ml with SPF20. To make your mind up for you, I would say it really depends on what your state of skin is, and what you want it for. Both the NARS and Laura Mercie Oil Free version (the only one I have) are better for coverage. The Laura Mercier feels quite thick and heavy on my skin. More importantly for me though, the colours in the Laura Mercier range tend to not match my skintone, and almost always oxidise rapidly on me so I look too dark and too orange. The NARS one is lighter in texture but still feels fairly thick on me. The Chanel Healthy Glow on the other hand is extremely lightweight and just makes my skin look naturally glowing and even. I also know that their shade B20 matches my skin spoton, and I don't get any oxidation. Yeah, you can tell, it's no competition for me. The Chanel wins hands down, even if the price/product ratio does make me squirm a bit. Lovely glowy skin here I come. If only I could turn back the clock to before I used this, for my bank balance's sake?